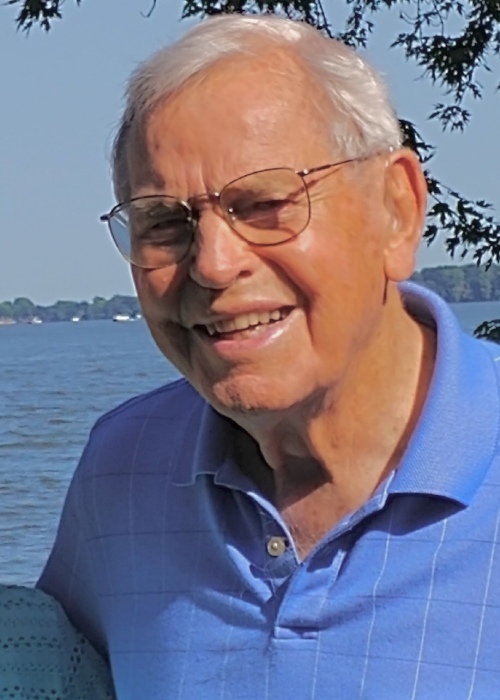 Ray Mittelstadt, age 94, of Storm Lake, Iowa died Friday, November 30, 2018 at the Buena Vista Regional Medical Center in Storm Lake. Funeral services will be held Tuesday, December 4, 2018 at 10:30 a.m. at St. John Lutheran Church in Storm Lake. Burial will be in the North Lawn Cemetery in Fort Dodge, Iowa on Tuesday, December 4, 2018 at 2:00 p.m. Visitation will take place Monday, December 3, 2018 from 4-7:00 p.m. at the Sliefert Funeral Home in Storm Lake. In lieu of flowers, memorials may be made to St. John Lutheran Church in Storm Lake or Camp Okoboji. The Sliefert Funeral Home in Storm Lake is in charge of the arrangements. Raymond Harold Mittelstadt was born August 19, 1924 in Storm Lake, Iowa the son of Franklin F. and Alma (Meyer) Mittelstadt. As an infant, he was baptized at the St. John Lutheran Church in Storm Lake where he was later confirmed. Growing up, he attended school in Storm Lake where he graduated from Storm Lake High School in 1942 as the class president. Following high school graduation, Ray enlisted in the United States Army on April 13, 1943. He was a heavy artillery instructor and a glider pilot trainer. He proudly served his country during World War II until he was honorably discharged on February 7, 1946. Upon returning home, Ray attended Iowa State University where he graduated with a degree in Engineering in 1949. He was employed by Iowa-Illinois Gas & Electric Co. in various positions in Fort Dodge and Davenport, Iowa, including gas distribution engineer, superintendent of gas service and superintendent of customer service. He retired in 1987 after more than 37 years and the family moved to his hometown Storm Lake. On July 6, 1952, Ray was united in marriage to Marilyn Tunwall at St. Paul Lutheran Church in Fort Dodge, Iowa. Together, they were blessed with three children: Mark, Sara, and Chad. Ray was an active member of St. John Lutheran Church in Storm Lake. He belonged to the Fort Dodge Men’s Civic Glee Club and Quartet which once performed at Kennedy Center. Ray was a Sertoma President; Camp Fire Girls area Board Member; Central Iowa Chapter of Archaeology; Chamber of Commerce and Buena Vista County Historical Society President. In his spare time, he enjoyed wood carving and working with stained glass. Ray thoroughly loved the outdoors especially fishing, canoeing, sail boating and ice boating. He also enjoyed archaeology. Ray was known to volunteer his time throughout his community. Family was important to Ray and he will be deeply missed by all who knew and loved him. Those left to cherish his memory include his wife, Marilyn Mittelstadt of Storm Lake, Iowa; children: Mark (Mary) Mittelstadt of Tucson, Arizona; Sara (Curt) Messerly of Fort Dodge, Iowa; Chad (Julie) Mittelstadt of Cedar Rapids, Iowa; grandchildren: Matthew Mittelstadt of Tucson, Arizona; Brent Mittelstadt of Oxford, England; Kyle (Kate) Messerly of Eau Claire, Wisconsin; Sophia, Nicholas and Ella Mittelstadt of Cedar Rapids, Iowa; sister, Doris Gutz of Chandler, Arizona; many nieces and nephews; cousins; extended family and many friends. Ray was preceded in death by his parents; brothers: Walter Mittelstadt and Franklin Mittelstadt; sisters: Irma Peet; Helen Larsen; Alice Schuelke; Lucile Evans; and Dorothy Langhans.